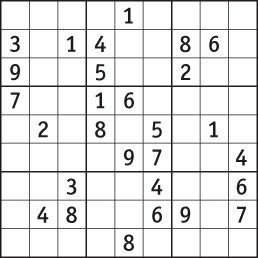 I just read an article in the Independent about Sudoku, and I couldn't think of anything else to write about :) Ages and ages ago when this first became a craze, I tried it out - and I admit, I ended up doing puzzles all the time, when I would normally have been reading, or worse, studying. It would take up all my time and I found my conversation limited to 'I finished one in record time/This one I'm doing now is too difficult!' until finally I decided to give it up altogether. For my sanity. And for my studies, and well, the good of all, really. But that's just me and my addictive personality - I still know lots of people who can manage moderation and I think sudoku puzzles are great. I love the fact that such a nerdy number puzzle game has become such a craze. So here's one for everyone - enjoy. Sudoku rules. I became totally addicted to it, too. I used to be addicted to variety puzzlebooks, especially the ones that contained logic puzzles. Now that Maddie requires constant watch as she pitter patters about, I don't have much time for puzzles. I downloaded a widget on my IMac for Sudoku, and I've been working on the same puzzle for days! Anyway, thanks for stopping by my blog. Vanna left you a letter.